Staged at the delightful Auditorium di Santo Stefano al Ponte Vecchio in Florence, Traviata Pocket Opera with Ballet offers the chance to see this popular opera in an abridged version with the addition of some superbly choreographed dancing. The production tells the tale of the love of Alfredo and Violetta, the famous characters in one of Giuseppe Verdi's world-renowned operas. Featuring all the well-known arias from the full version, audience goers will watch a spell-binding performance full of passion and excitement in a beautiful setting. The production begins at 8:30 pm and runs for approximately an hour and a half. Therefore, it is ideal for newcomers to opera as well as seasoned music buffs. 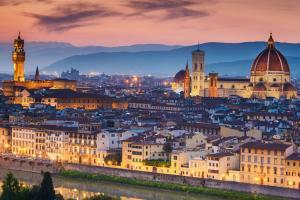 The pocket opera is put on in the heart of the city, close to the beautiful Ponte Vecchio. The glorious Santo Stefano al Ponte Church is among the oldest Renaissance structures in Florence and its auditorium is noted for its superb acoustics which lend themselves to the enjoyment of operas and other forms of music. Romanesque, Gothic and Baroque architecture come together in a formidable display of styles which will delight the senses almost as much as the performers. Indeed, the building is often considered to be worthy of a visit in its own right, even without the top-notch entertainment on offer. Featuring a soprano soloist, as well as a tenor and a baritone, La Traviata Pocket Opera includes a grand piano and a double bass providing musical accompaniment. Trained ballet dancers also take part in the staging of the opera, adding a great deal of depth to the story telling. Like the vocalists and musicians, the dancers who take to the stage are all of a high quality and many of them have worked professionally in ballet for years. This production of La Traviata is the perfect way to enjoy an evening of high culture in the enchanting city of Florence that will linger in the memory long after it has passed.